for £15 postage paid world-wide. For listeners whose appreciation of Charles Villiers Stanford does not extend beyond ‘choirs and places where they sing’ it may come as a surprise to find out that he composed a vast catalogue of music – both sacred and secular. This includes eleven operas, seven fine symphonies, many oratorios and cantatas, a number of concerted works, songs and part-songs, chamber music and arrangements of Irish folk tunes. Nevertheless, for enthusiasts of the whole range of Stanford’s music it may come as a revelation to read Christopher Howell’s statement that Stanford 'had amassed by the end of [his life] a corpus [of piano music] equal to, or greater than such near contemporaries as Brahms, Tchaikovsky, Grieg or Dvorak.' Personally, I knew he had written a great deal for the instrument, but never guessed quite so much. Unfortunately, the critical study and reception of Stanford’s piano works have been hampered by Fuller-Maitland who stated that ‘the piano works of … (Stanford and Parry) need not detain us long‟ (Fuller-Maitland, J.A., The Music of Parry and Stanford, an Essay in Comparative Criticism, Cambridge: W. Heffer & Sons, Ltd., 1934). I guess that there are reasons why Stanford’s piano music — as well as much of the rest of his works — has suffered neglect. One explanation being the ‘conservative’ sound-world that made use of ‘outdated’ forms and a relatively traditional palette of musical devices and harmonies. We must never forget that in France, Debussy was discovering a whole new realm at a time when Stanford was writing sub-Brahms and Schumann. Even in the United Kingdom composers such as William Baines, Cyril Scott and John Ireland were responding to the influences of Debussy, Scriabin and even jazz. Yet now, we can, I hope,) appreciate music at more levels than simply being ‘progressive’ or ‘modern’. Stanford offers thoughtfulness, classical structure and exemplary technique. He is also a romantic at heart who is suffused with the spirituality, passion and the wit of Ireland. It makes for a potent and satisfying mixture. Stanford’s piano music has been largely ignored by pianists, concert promoters and record companies. In my vinyl collection I still have John Parry’s performance of the Three Rhapsodies coupled with Hubert Parry’s charming Shulbrede Tunes. This was issued on the Pearl label in 1978 on SHE546. Nearly twenty years later Peter Jacobs played both sets of Preludes and the ‘Dante’ Rhapsodies on the Priory and Olympia record labels: PRCD449 and Olympia OCD638. Another ten years were to elapse before the present pianist released Land of Sunset Glories on Sheva SH019. This was a selection of Stanford’s piano music culled from his entire catalogue. Apart from various editions of the Irish Dances, op.89 there has been nothing else on CD. One honourable exception to this - although not on CD - has been the sterling efforts of Philip Sear on YouTube who has recorded a few of Stanford’s pieces along with a huge range of other rare, but often stunning, music. I do not want to examine each of these works in detail: it would take too many words and would only repeat what Christopher Howell has written in the liner-notes. However, I do want to make some suggestions as to how to listen to this double CD set. I would recommend taking each piece or group of pieces together, but not through-listening to the entire CD. For the Twenty-Four Preludes, it is probably better to listen to them half a dozen at a time. It is unlikely that Stanford would have wished them all to be taken at a single sitting. There is a wide range of forms and titles presented here. There is also a considerable chronological spread, with the earliest being the Six Waltzes (1876) and the latest the ‘Three Fancies’ which were published some 48 years later in 1924, the year of the composer’s death. There is also a disparity of technical demands with two sets of the Associated Board ‘Six Sketches’ (Primary) and (Elementary) which were written in 1918 complementing the challenging ‘Five Caprices’ and the Preludes, op.163. I started my exploration with the two sets of ‘Six Sketches’ which were written for aspiring pianists. I have had a copy in my library for many years and often play them. Their simplicity is their charm. The ‘Primary’ set have some ‘learned’ titles such as Gavotte, Scherzo, Minuet as well as something a wee bit more playful such as ‘Morris-Dance’, ‘Lullaby’ and ‘The Hunt on the Hobby Horse’. The second set has imaginative titles: ‘The Doll’s Minuet’, ‘The Bogey-Man’ and ‘Hop-Jig’. All twelve are straightforward to play, but here and there a little tripwire is found to upset the unwary or over-confident. That is why the Associated Board has found, and still finds, these sketches useful for examination purposes. I often wish that recitalists would include the odd ‘didactic’ piece in their programmes: it is enlightening to hear pieces that I have plonked away at for years played properly. Many years ago I inherited a number of editions of The Children’s Music Portfolio which was a serial edited by Thomas Dunhill around 1922. Amongst the songs and piano pieces by a variety of British and continental composers was a selection of Irish Folk Tunes arranged by Stanford. I recall that I struggled to play them effectively. Howell gives a reason: Stanford provided a relatively involved and constantly changing accompaniment to the simple tune which became a little tricky to execute for young or unpractised fingers. They include ‘The Minstrel Boy’, ‘St Patrick’s Day’ and ‘The Meeting of the Waters’. These are the only arrangements of Irish tunes for piano — many folk-songs were arranged — that Stanford made. I loved hearing these miniatures played with considerable sensitivity here. The ‘Three Fancies’ are new to me. They were issued in the last year of the composer’s life. These are more complex than the Sketches, although they were also written for students. Howell suggests they are at about Grade 5. I particularly like the opening ‘Fancy’ which could be entitled ‘Bach walks down Grafton Street’ with its reel-infused ‘invention’. The first CD opens with Six Waltzes which were composed when Stanford was 24 years old. They are the earliest examples here. All six waltzes are connected by a bridge passage and there is a final coda. These are striking pieces that are clearly derivative of Brahms. Howell notes that there are also ‘echoes’ of Dvorak in these pages, in spite of the fact that it is unlikely that Stanford would have been aware of the Bohemian’s music. Many years later Stanford revisited the form with his Three Waltzes, op.178. They were published in 1923, but had probably been composed some three years earlier. They are evocative reminiscences of an earlier age. Look out for allusions to Beethoven’s ‘Fur Elise’ in the opening number. Waltz No.2 is full of energy and exuberance. There is a good characterisation of contemporary salon music in the third number. Stanford wrote his Six Characteristic Pieces, op.132 in 1912 for the pianist Moritz Rosenthal, who was slated to perform the composer’s stunning C minor Piano Concerto. Unfortunately, the pianist failed to play either of these works. The opening piece, ‘In Modo Dorico’ was clearly important to the composer. He arranged it for organ as well as utilising it in his opera The Travelling Companion. The final ‘Toccata’ was used as an ‘advanced’ grade piece in 1921. It is an incisive number that is almost dance-like in its progress. Here and there the listener can seem to hear an allusion to the as yet unwritten ‘I got rhythm’ by George Gershwin. The ‘Romance’ is quite beautiful and passionate in its mood. The ‘Study’ has a touch of Mendelssohn about it whilst the ‘Roundel’, which was dedicated to Robert Schumann, is largely reflective and intimate without being pastiche. The Five Caprices, op.136 (1913) are difficult and complex and demand a high level of technical ability. The opening piece is a bravura march. The second is written in a dark, mystical Celtic mood that seems far removed from anyone’s idea of a ‘caprice’. I agree with Howell’s suggestion that this is a ‘pianistic parallel to the … Caoine (dirge sung by mourners) from the Clarinet Sonata.' For me, this is one of the most impressive pieces on this CD and also in Stanford’s piano music. Caprice no.3 in G minor nods towards William Sterndale Bennett: the middle ‘trio’ section is particularly attractive. I was struck by the thoughtful working out of the fourth Caprice - lots of Brahmsian ‘thirds’ and ‘sixths’ in the right hand. Surely this is Stanford telling a story? Howell does suggest it could have been called a Ballade-Caprice. The set ends with a lovely waltz. It makes for a good ending to what is one of the most impressive works on this CD. This is music that is largely summative in effect rather than ground-breaking. The composer is clearly looking back rather than speculating on the future. The fact that this manifestly ‘tonal’ sequence was devised at a time when other composers were indulging in atonality and presiding over the breakdown of the tonal system is surely telling. Yet these are lovely, often sensual, pieces that defy categorisation. We can listen to these with an open mind and enjoy the drama, the passion, the variety, the invention and the grandeur of design for what it is: a major contribution to British piano music. The liner-notes (by Christopher Howell) are superb. A short essay looking at ‘Stanford the Pianist’ explores the composer’s relationship with the instrument from a highly competent youthful performer to his love of playing chamber music and song accompaniments in his later years. There is then an overview of the piano music before a dissertation-style examination of each of the pieces or sets of pieces. I was delighted by Howell’s performance. It would be so easy to be patronising when playing the ‘grade’ pieces, however he brings the same dedication and conviction — backed by a clear scholarly understanding — to all this music no matter how elementary or technically difficult. The sound quality is excellent, with both the piano tone and the general ambience impressing me more than on the earlier disc. 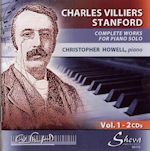 When I reviewed Christopher Howell’s Land of Sunset Glories back in 2009, I proposed that the only problem was that he had ‘teased us’: it certainly left this listener wanting more of Stanford’s piano music. Howell told me then, that the entire catalogue of piano music, including works still in manuscript, would require some six CDs. I also noted in my review that it could be difficult to ‘present the ‘collected’ works now that he has started to ‘cherry-pick’ – suites and groups of pieces really ought to be kept together – the great with the less good, even.’ Howell has resolved this obvious problem by starting over again. He told me that all the pieces on Land of Sunset Glories ‘will be recorded again for consistency of acoustic’ – this is essential as the piano and venue have changed. I also note that he has presented multiple ‘movement’ works in order and together. This is an immense project, but one that I believe is ultimately important, worthy and a major contribution to recorded British music. I eagerly and impatiently await succeeding releases in the series. With this Sheva set the tide of recorded music continues to rise around Stanford's catalogue. Think of it: at one stage, not so very long ago, the only commercial recording of Stanford's symphonies was EMI Classics' version of the Third Symphony conducted by Norman Del Mar; now we have two complete cycles (Chandos and Naxos). The eleven operas are expensive to mount - a major commercial outlay and risk - and remain largely unexplored. As for the chamber and solo instrumental music it is more amenable to the confident and to the enterprising. To the advantage of the explorer-listener, collector and the musician, enthusiast and academic Christopher Howell presides over this 2 CD release - the first of three such boxes that set about presenting the piano music of Stanford complete. It comes as no surprise that here in volume 1 all but the Characteristic Pieces op. 132 and the Twenty-Four Preludes op. 163 are either first recordings or first complete recordings. Howell (who writes for this site) has a distinguished track record with Stanford and this is by no means his first foray into that composer's catalogue. His article on the piano music is well worth reading. As for his recordings there are a substantial number, mostly on Sheva and these are available direct from MWI: the complete music for violin and piano on 3 CDs (review ~ review), Land of Sunset Glories (a selection of the solo piano music) (review ~ review), The songs of old Ireland (review) and the music for clarinet and piano (review ~ review). In 2004 Howell recorded the Stanford cello sonatas for Meridian with Alison Moncrieff Kelly (review). The liner-note for Volume One is satisfyingly detailed and readably informative. This is one of those cases where the pianist turns out to be an excellent choice to provide commentary; not always the case. The music is not sequenced chronologically which is welcome. Each disc - at least of these two - presents a nicely balanced mix of the early, the occasionally somewhat mundane, the didactic and music of great reach and emotional ambit. CD 1: The Six Waltzes are the product of a 24 year old. They are fluent, confident and pleasingly shaded. No. 4 is rather touching. Is No. 5 a waltz? I think not despite its name: it kicks up its heels rather a lot. As for the Coda it comes across as an unexpectedly earnest romantic departure from what has gone before. The Three Waltzes date from 44 years later. These are respectively, friendly and unassuming, full of character, Brahmsian tempest and halting delight. The Six Characteristic Pieces op. 132 include the gravely dignified In Modo Dorico (1912), the Romance in B flat in all its Schumann-like flow of life and vivacity, the Rondel, which is in memoriam Schumann but which is no pastiche, and a flighty yet regal Toccata. The Five Caprices include the lunging romance of No. 1, the grand rhetoric of No. 2, the Skittish then slow G minor and the final Tchaikovskian Tempo di Valse. CD 2: The twelve Sketches (1918) are tuition pieces: Mozartean at times, resourceful, sometimes touching or carefree and in the case of the last of them inflected with a country dance levity. The Three Fancies (1924) are variously settled and calm or dramatic. The first of them is strongly Brahmsian. In the Five Irish Folk-Tunes Stanford has a gentle hand on the tiller and leads us on a journey that takes in both the touchingly hesitant and the dancingly light-footed. For this listener the most notable aspects of these impressive Twenty-Four Preludes op. 163 are: a winged Prelude that rustles with the spirit of "pastime in pleasant company" (tr.25); music of emotional reach (26); regal Brahmsian heroism (27); sly Bachian charm (29); salon shallowness (30); a softly icy glisten (33), a funereal cortege (36); trilling and thrilling Rachamninovian bells (41); guileless moderato (43) and a liquid chuckling essay (44). Sheva's treatment of these two discs is very decent apart from the font used in the booklet and insert. The characters are small and the print has a tendency to bleed and blur. It remains manageably readable which is just as well because Howell has much of value to tell us. The two discs are pleasingly presented in a single width case. One stage at a time: but I do wonder whether - after the next two volumes - Christopher Howell and Sheva intend to tackle the three piano concertos; not that they have not already been recorded: (Hyperion 1; Lyrita 2; Chandos 2; Claves 2; Antes 2; Lyrita 3). So far as this release is concerned it can be welcomed very warmly indeed. Another rewarding perspective opens up and there's more to come.